Bertoia Auctions’ Fall Start Sale brings in the fall season with yet another offering of fantastic Marklin treasures. We start off with a beautiful ocean liner with the sailing name “Amerika.” This wonderful vessel is propelled by a real live-steam power plant fueled by an alcohol burner. The ship is said to be from the original family that purchased the boat nearly a century ago. The vessel is a fine example of the Marklin boats produced in the later years until production of such large ships finally stopped in the late 1920s. The “CONGRESSIONAL LIMITED” is a favorite American steam outline train and came in several different variations and gauges. The example here includes a passenger car, combine car, and a wind-up locomotive with classic American trains like the front cattle catcher and bell. The combine car has a sliding door perhaps for loading larger freight and is partially filled with seats for passengers. 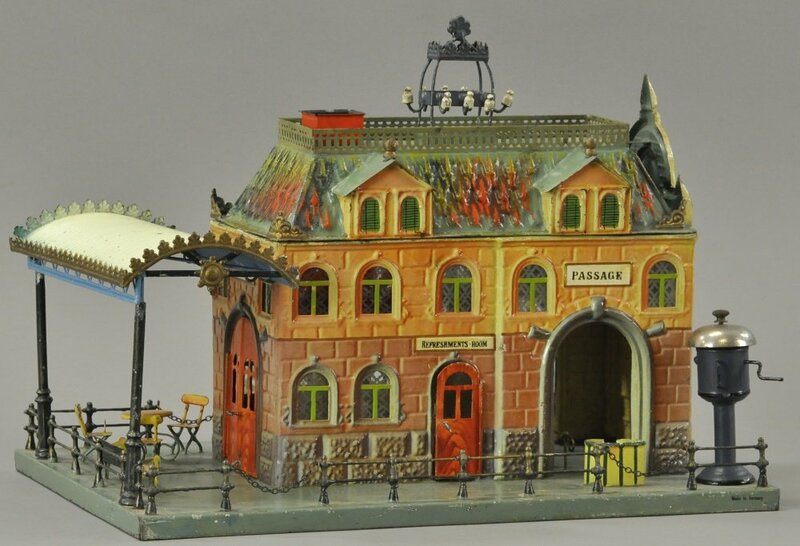 With a side patio, cafe chairs, an ornate awning, ticket booth, and signal bell, this wonderful “Central Station” in Gauge 1 is perhaps the most simple variant of the ultra-rare class of stations that are larger and more ornate stations, such as the “Cafe Station.” This example is believed to be Nr. 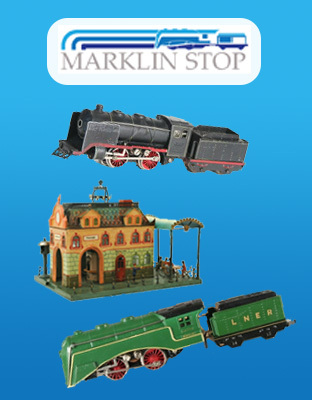 2651/1 as found in the 1904 main product catalog from Marklin. The catalog describes two variations of this station, one in Gauge 1 and one for Gauge II with two side halls. Other similar stations such as Nr. 2650 uses the same building form and structure but do not have a side hall. Station Nr. 2650/1 is the same but comes with an attached overhead awning high enough that a train can pass through on an included piece of track. Our example here appears to be in excellent condition. It has English writing for “Passage” and “Refreshments Room” so must have been for the American market or other large English-speaking markets. There are many different variations of this station, some with Dutch, German, Spanish, or French inscription. The French version is also special because it is sometimes painted in a predominantly bright red and white color scheme. The Hudson locomotive is a favorite for any collector interested in American-style trains especially with the front cowcatcher. This O Gauge example is probably the “newest” of the lots we have selected here as it was produced in the 1930s for the American market. The auction description states that only 50 were produced. 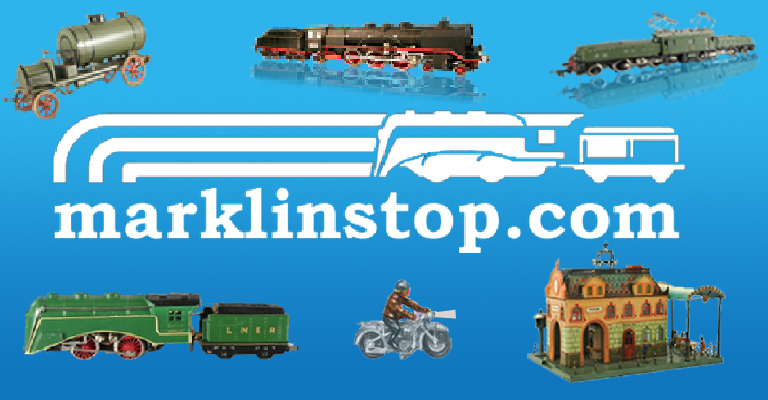 Marklin rarely released production quantities and even when they did collectors still debate how many were actually produced in all series including prototypes, pre-series, special variations, etc. Whatever the quantity, this locomotive was probably imported by Richard Marklin who was the American importer for Marklin by the name of “Richard Marklin Toys.” The collector that buys this locomotive will have to search long and hard for an accompanying tender or settle for a well-made replica. And then the hunt begins for a string of cars for this steam locomotive to haul around the tracks. The green New York Central Pullman cars measuring over 50cm long would go very well with this loco or its brother the Commodore Vanderbilt. View the full online catalog on LiveAuctioneers.